Vehicle access through Logan Pass on the Going-to-the-Sun Road in Glacier National Park is anticipated to be available tomorrow morning, Friday, June 17. Park road crews have finished snow removal, debris clean-up, guard rail installation, and facility preparation, and have assessed snow conditions. Services at Logan Pass will include restroom facilities and potable water. The Logan Pass Visitor Center is scheduled to open on Saturday, June 18. Beginning that day, the visitor center will be open daily from9:00 a.m. to 7:00 p.m through September 5. The center offers visitor information and ranger programs, and includes a bookstore managed by the Glacier National Park Conservancy. Visitors will need to drive with added caution along Rim Rock, just below Oberlin Bend on the west side of the Going-to-the-Sun Road where concrete barriers are temporarily serving as the guard rail. Approximately 65 feet of the masonry guard wall was destroyed by an avalanche following a late-May winter storm and the concrete barriers further tighten an already narrow two-lane roadway. The long-term repair for this section of masonry guardrail, along with several other portions of the road is currently scheduled for September. Once the road opens to vehicle traffic, the hiker-biker shuttle will stop operating for the season. Bicyclists are reminded that bicycle safety restrictions on the Going-to-the-Sun-Road will go into effect when the road opens on June 17 and remain in effect through Labor Day,September 5. Bicycles are prohibited between Apgar Campground and Sprague Creek Campground from 11 a.m. to 4 p.m.In addition, bicycles are prohibited eastbound (uphill) between Logan Creek and Logan Pass from 11 a.m. to 4 p.m.For information on bicycle restrictions and average bicycle times, check the park newspaper available at park entrance stations or online at http://home.nps.gov/applications/glac/inforequest/inforequest3.cfm. At Logan Pass, visitors will discover a snow-covered landscape and should be prepared for cold temperatures and wind. Icy conditions may also be encountered. Standing or walking on snow along the road is strongly discouraged. Be aware of snow walls along the Going-to-the-Sun Road and hazardous snow bridges that could collapse next to the road near Big Bend and the Big Drift. Trails near Logan Pass will be covered in snow and visitors should exercise caution when hiking. Be aware of unseen holes in the snow and snow bridges that exist. Avoid crossing steep, snow-covered slopes where a fall could be disastrous. Visitors should have the appropriate equipment and skills if hiking on snow. The Highline Trail from Logan Pass is closed due to snow conditions. Current status of park trails can be found at http://www.nps.gov/glac/planyourvisit/trailstatusreports.htm. There are vehicle size restrictions for the Going-to-the-Sun Road. Vehicles, and vehicle combinations, longer than 21 feet and wider than 8 feet are prohibited between Avalanche Campground and Rising Sun. Vehicles over 10 feet in height may have difficulty driving west from Logan Pass due to rock overhangs. Interpretive bus tours of the Going-to-the-Sun Road and other areas of the park are available through park concessioners, Glacier National Park Lodges and Sun Tours. 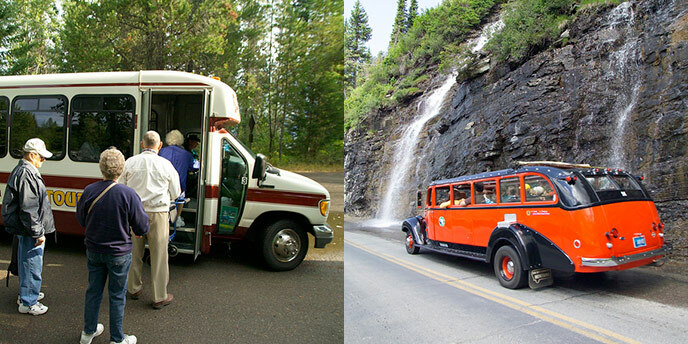 For more information and reservations, visit http://www.nps.gov/glac/planyourvisit/bus-tours.htm. The park’s free shuttle system will begin operations on July 1 and run through Monday, September 5, Labor Day. The transit system provides two-way service along the Going-to-the-Sun Road between the Apgar Visitor Center and St. Mary Visitor Center, including a hiker express shuttle departing from both visitor centers at 7 a.m. Rehabilitation work on the Going-to-the-Sun Road will continue this year with activity near the St. Mary Entrance Station, though no delays are expected. Sun Point will be closed again this year to all visitor traffic including picnicking, transit, restroom use, and hiking due to road rehabilitation activity. For current information on park roads, weather conditions, and visitor services visit Glacier National Park’s website at http://www.nps.gov/glac/index.htm or call park headquarters at 406-888-7800.